In the wake of the violent “Unite the Right” in Charlottesville, there have been a series of counter protests where Confederate statues are torn down. The term “Confederate statue” is a bit of a misnomer since most were put up during Jim Crow and the 1960’s. An enormous number of these statues were put up in and around the 20’s by a group called the United Daughters of the Confederacy. Many of these statues were put up in North Carolina, the state has the second most Confederate monuments in the nation. These statues are also quite unlikely to be removed by local governments due to a North Carolina statute, passed in 2015, which forbids removing Confederate statues without approval from the state. With this in mind, perhaps it’s no surprise that Durham, NC has been the center of one the most publicized incidents of a statue being destroyed. 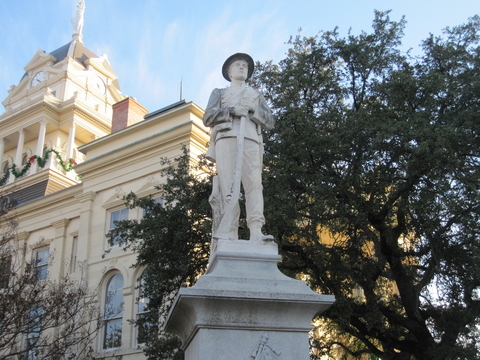 Dunham used to have a statue of a uniformed Confederate soldier boasting a Confederate flag and an engraved pedestal reading “In memory of the boys who wore gray.” The statue was not constructed until decades after the Civil War, being put up in 1924 during the height of Jim Crow. A few weeks back, this statue was pulled down by a group of protesters. Video shows the statue crumpling instantly after it is pulled down-this is because these statues were mass produced very cheaply during the 20’s by a company known as the McNeel Marble Company. At the protest itself, the police hung back and allowed the protest to continue-citing an admirable stance that statues can be replaced but lives cannot. The protest itself was not violent-unless you count the violence done to the statue-an nobody was injured. After the protest, however, the police began using footage from the event to begin making arrests. The first to be arrested was the woman who actually pulled down the statue-Takiya Thompson. The 22 year old woman stood by her actions-citing the need to destroy statues honoring a history of slavery and racism-however she is facing a number of misdemeanor and felony charges-disorderly conduct by injury to a statue, damage to real property, and-the felony charges-participation in and incitement of others to riot with property damage in excess of $1,500. These crimes can carry up to several years in prison. After the arrest, the police made it clear that they were going to arrest several more participants in the protest. In response, several hundred people lined up in front of the Dunham to “confess” to their involvement in the destruction of the statue. Ultimately, the police used video from the protest to arrest seven more protestors and charge them with the same crimes facing Ms. Thompson. These are serious charges facing the Dunham protestors and the truth is there is a strong case against them. It’s likely that they acted knowing the potential consequences but still chose to destroy the statue as a matter of principle. Either way, it’s worth understanding the law here in order to, if you want to protest, protect yourself as much as possible. Rioting is defined a little differently depending on which state you live in. However, the definitions tend to be fairly similar. A riot usually is any situation where two or more people disturb the peace through either the use or threat of force, violence, or destruction or burning of property. Where somebody does this as part of group sufficient to constitute a riot, they have participated in a riot. Incitement to riot is generally urging others to do the above. However, there are some additional requirements before you can be found guilty. First, your urging must be done in a situation where it produces an immediate, real, chance that you’ll actually convince people to riot. Second, you have to actually intend to cause a riot-it isn’t enough to say something that causes a riot if that is not your goal. It is worth noting that you have to actually be convincing people to riot. Courts have ruled that it is not enough evidence to convict where you are doing something like throwing rocks at the police-although throwing those rocks would likely lead to much more serious criminal charges. North Carolina’s rioting laws are very similar to this usual format. They require at least three people before something can be called a riot and enhance the penalties if somebody is badly hurt, property damage exceeds $1,500 (as with the statue), or the riot participant charged possessed a dangerous weapon or substance. The statue was worth over $1,500, thus the felony enhancements even thought the protest was non-violent. There were also many more than three people there. The participation in a riot charges against these eight protesters are going to be hard to fight. The incitement charges, on the other hand, require quite a bit more specific evidence to establish. This could leave these protesters with a bit more wiggle room. The charges will hinge on what can be seen and heard in the video taken of the protest and witness testimony. These protesters broke the law. The police are doing their jobs by arresting them. From a legal standpoint, it would be irresponsible to recommend any illegal course of action. However, with that being said, why are we preserving these Confederate statues? Some cite their historical importance and the heritage they represent. Do we really want to honor our history of slavery with heroic war statues? It’s indisputable that a desire to preserve the practice of slavery was a central motivation-if not the exclusive motivation-behind the Confederacy and the Civil War as a whole. Even North Carolina’s governor, Roy Cooper, has expressed a desire to remove the statues and a frustration over laws blocking him from doing so. Those who have been arrested in Dunham broke the law. However, what they did is something we should be encouraging our politicians to do through legal means anyway. In statements to the media Takiya Thompson-the first to be arrested and the person who pulled down the actual statue-has stated that she and those with her were tired of waiting for local politicians to get around to removing the statues themselves. Can we blame her for being upset that a monument to racism stood for nearly a century without removing it?